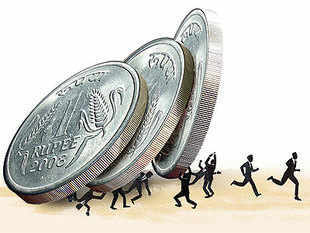 The rupee retreated from 13-month lows after the central bank stepped up intervention, while bonds also recovered despite concerns over whether foreign funds will stick with India, one of the star performers this year among emerging markets. Intervention from the Reserve Bank of India was larger than in recent sessions, traders said, with some estimating dollar sales of nearly $500 million. Meanwhile, buying of shares by state-run Life Insurance Corporation of India helped shares recover from earlier falls to trade flat, dealers added. Analysts fear more foreign selling, but doubt it would spark turmoil anywhere similar to last year when India suffered its worst market crisis since 1991. Unlike then, India is now seen as benefitting from sharp falls in inflation, hefty foreign exchange reserves, and a less troublesome current account gap. “We are less worried as overall market conditions are better, like fiscal condition is within control, current account deficit is low, inflation is falling,” a senior policymaker aware of the central bank’s thinking told Reuters, declining to be identified discussing the country’s exchange rate policy. The partially convertible rupee ended at 63.6150/6250 per dollar, weaker than its 63.53/54 close. It had earlier weakened to as much as 63.89, its lowest since Nov. 13, 2013. The rupee’s initial weakness came after foreign funds sold shares worth $196.56 million on Tuesday, their biggest daily net sales since Oct. 17, and a sixth consecutive day of selling. Foreign investors also turned sellers of debt for the first time in December on Monday, having sold a net $146.56 million. But analysts say India is better placed to withstand foreign selling, given the current account deficit has narrowed to 2.1 percent of gross domestic product from a record high of 4.8 percent in the fiscal year ended in March 2013. Meanwhile, foreign currency reserves stood at $314.66 billion as of Friday, not far from the record high of $320.785 billion in September 2011. India has attracted a combined $43.2 billion in foreign flows into debt and shares so far this year. As a result, the NSE index is still up around 25 percent in 2014, the second-best performer in Asia in dollar terms. The benchmark 10-year bond yield hit a session high of 8.03 percent, its highest since Dec. 1, before retreating to end the day down 2 basis points at 7.97 percent. The yield is still up 14 bps for the week. (Editing by Rafael Nam, Sunil Nair and Jacqueline Wong).